The Tarot forecast for October 29 through November 5 makes for a Halloween of self-discovery and a journey of examining your deepest regrets. 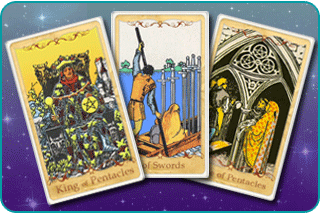 The three-card spread drawn to begin this Friday, October 29, features the King of Pentacles in the past position, the Six of Swords in the present position and the Three of Pentacles in the Future position. Read below to see how the week ahead is likely to unfold and what you can do about it now that you are armed with such foresight. The card drawn in the past position is the King of Pentacles. This is a card of leadership, material wealth and plenty. It describes the recent past leading up to October 29. The card in the past position is the foundation of the reading. Before we know where we are at, we must know where we have been. The King of Pentacles confirms some truths about the week leading up to Friday. If you have been dealing with an authority figure who has ample resources but drives a hard bargain, the foundation of this reading is your relationship to the authority that you are under and material wealth that eludes you. If you were feeling manipulated by a lover who seems to be one step ahead of you in a race to always be right and immune to criticism, your relationship is the foundation of this reading. The King of Pentacles card is illustrated with the man himself astride his throne. Many Tarot decks illustrate his garb featuring a pattern of grapes. This is an ancient symbol of having many material possibilities due to wealth. Grapes are fruit, they are made into wine, and they represent the harvest of a vineyard on an estate that supports itself with what it grows. For purposes of this reading, the King of Pentacles represents some great possibilities in love, money, career or all of the above. The past week has brought you close to a transformation in these areas and to the right person with whom to plant a fruitful vineyard. As we transition into the present, you may have trepidation about moving closer to such palpable power. It may be time for a soul-searching journey of sorts to see why you behave the way you do when the situation is not necessarily in your control. In the Tarot deck, Swords represent ideas, thoughts and words. The Six of Swords is the card drawn to represent your present in this reading. This is the card that shows what is going to take place now – Friday October 29 through Halloween. By the time the workweek starts it will be a new month and the energy of the future card of this reading will be upon us all. This card represents the slow journey we take when we realize that a compromise is needed and that what we wanted a situation to be will never be as exactly as we pictured. This card features three people, none of whom face the viewer. They are on a boat headed across a body of water. In the boat are three large swords standing as if they have each been stuck into the floorboards. In this reading, these swords represent the words that you know you will need to soon say. The journey this craft is taking is giving you time to think (and Swords are the best suit of the Tarot under which to ponder a situation). Your present situation is one of deep thought and patience. You are at the beginning of a journey into the core of your mindset. What determines why you think about things the way you do? If the issue is control, be it at work, school or in a relationship, are you operating from a position of empathy, cooperation or selfish entitlement? Think about all this as you ponder the foundation, or past, of the current situation. You have time and the universe should make this a calm weekend with ample space in which you can get cerebral. As you transition into next week, your thoughts on the current situation will form a new paradigm to accommodate the ideas and input of others. Accepting that it might be time to work as part of a team will mean that your boat from the Six of Swords has docked and you are ready to step on the shore of the future. The future is looking rock solid and upbeat. Next week will be one in which your ideas and input will be warranted and wanted. But there are other people who will need for you to accept them. There is a diverse set of experiences that is coming together in your world next week. Embrace the different things that everyone has to offer. Instead of being alone with your possessions like the King of Pentacles, it is time to group with other people for a solution. Instead of turning away from all points of view like the boat passengers on the Six of Swords card, the future insists that it is time to get informed by the variety of experiences that the world has to offer you. The Three of Pentacles features an illustration of three very different people working together to complete the construction of a cathedral. A mason is leveling the high bricks while a nun holds the architectural drawings and a priest oversees the day’s activities. Apart, their energies would get nothing done. Together, they are putting the finishing touches on a building that will be around hundreds of years after them. Your forecast then sees a foundation of authority laying down the law, saddening you into a retreat where you ponder a solution to how these absolutes make you feel. That is what is going on with you right now. The solution is to learn to work with others in the near future so that you will be seen as partially responsible for completing a monumental project.